This book of short school plays and holiday skits can be used to promote drama in the elementary school classroom. Integrating music and drama is also an option to get your students more involved in the curriculum. Don't miss out on this one! Introducing drama in the classroom is a great way to get your students involved in their own learning while having fun, too. Differentiated learning can oftentimes create teaching challenges and cause conflicts in the classroom. Practical Plays by Cyd Moore uses creative drama to teach concepts to a variety of learners such as visual, aural and kinesthetic. 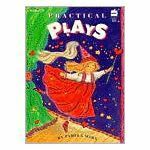 This book contains six plays to be performed by children in grades one through five. The subjects covered are: Halloween, Thanksgiving, the Winter Holiday, Valentine's Day, Brotherhood/Community, and the Environment (Earth Day). These plays can be performed by an individual class or by a larger multi-age group as well. They are so simple that no prior theatrical experience is necessary and only the bare minimum personnel and supplies are required. Students as the performers and students as the audience both learn from play performance and production. The performers must learn responsibility, vulnerability and teamwork, while the audience learns how to be good listeners and how to use manners as well. This book offers teachers a way to enhance the curriculum by making history and culture "come to life" for the students. Creative drama and characterization can demonstrate feelings and attitudes that children cannot always visualize from reading a book or listening to a story. Plays make it that more "real" for them. Table of Contents: This book contains an organized table of contents that is divided into sections by play title. Introduction: The introduction in this book discusses the significance of dramatic play and theater in the classroom and its benefits. It also addresses teachers' concerns about play production, costume and scenery design, rehearsal schedules, and how to set up a rehearsal for the students. It even provides teachers with some costume and rehearsal tips and suggestions. Chapters: Each chapter or section begins with a new play. Each of these sections includes an explanation of why children should perform that particular play and how they will benefit from it; how to prepare the children for performing the play (performing activities, writing activities, and cross-curricular activities); how to stage the play (scenery, costumes, props, etc. ); the script itself; and suggested readings or songs that could be used in addition to the play or as supplemental material. What I love about this book of plays the most is that everything has an explanation. It is very thorough, so if you do not have much experience in theatrical performances, you do not have to worry. All of your questions will be answered. Each play allows for flexibility and adaptation for various age levels and learners. The kids really enjoy performing these short plays; there are easy lines and the stories are fun. The only negative aspect of this book is that there are not more plays to choose from. This book can be purchased very cheap now because it is a little older. I have seen it anywhere starting at $0.99-$2.00. If you are on a budget, this one's for you! Overall, this is a great Music/Drama resource for any elementary classroom teacher that is looking for a way to extend their curriculum while introducing their students to new, self-advancing skills that will ultimately prepare them for their lives ahead. I feel that the greatest enjoyment in teaching anything, is the sense of accomplishment from your students. They develop a sense of pride that no one can take away and that alone makes this book so worth it! Here are some great Music teacher resources that I thought I would share with you. Whether, you are a new teacher or veteran, you can always use fresh ideas for your Music or general classroom. Enjoy!